In recent years, many Canadians have become increasingly disillusioned with banks. Many Canadians are hoping to get a consolidation loan for their debt, but it’s difficult to convince a bank to provide an unsecured loan for an amount that provides them relief. Companies like Borrowell are shaking things up in the financial services industry in Canada, disrupting the banks and letting those with good credit histories to consolidate their debt without the need to go through traditional banks. 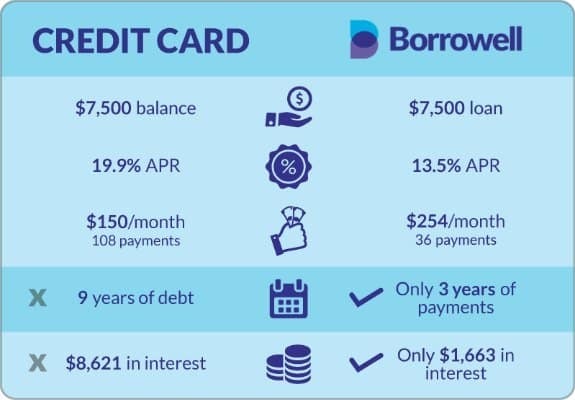 Borrowell is one of the easiest ways for Canadians to lower their interest rates on credit card debt, and adjudicate almost instantly to provide you with options for an online loan that works for you. 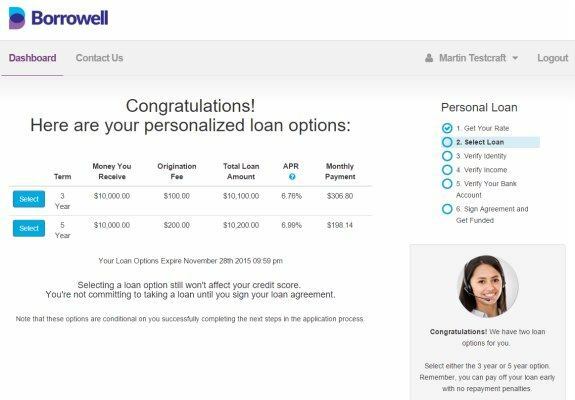 Borrowell is a lending platform that connects borrowers to lenders quickly and easily. With Borrowell, you apply for an unsecured personal loan of up to $35,000. You can use the loan for anything you want, without putting up collateral. However, the most common use for Borrowell loans is debt consolidation. Credit card interest rates in Canada can be very high, commonly between 19.9% and 29.9%. If you are trying to dig out of credit card debt, it’s difficult to find success with rates that high. Paying your minimum can result in decades of debt repayment. Refinancing your credit card debt to a lower rate through a more traditional bank often means putting your home up for collateral. This is where a company like Borrowell can really help. Borrowell focuses on providing loans to those with fairly good credit. In order to qualify for a Borrowell personal loan, you need a credit score of at least 660, and the average borrower has a very respectable score of right around 700. When you’re approved, it’s possible to get a rate as low as 5.6%. However, your actual interest rate will depend on your credit score and other creditworthiness factors. Even if you pay a higher rate, chances are that it will still be lower than what you currently pay on your credit cards. Using a consolidation loan as part of your plan to get out of debt can be a good move, but you do need to be careful. This strategy only works if you have stopped digging the debt hole. Before you consolidate your credit card debt, make sure you have changed your financial habits so that you live within your means. You don’t want to consolidate your credit card debt and then rack up new debt using the cards. That just puts you in an even worse position. Also, be wary of closing credit cards after paying them off using a Borrowell loan. Closing your credit cards can impact your credit score, and make it harder to get the credit you need for a car or home loan down the road. However, if you don’t think you have the self-discipline to keep from spending using the credit cards it’s probably better to close them. The idea is to improve your situation and be out of debt in three to five years, not make the situation worse. One of the things I want to emphasize in this Borrowell review is how easy the application and verification processes are. Online loan companies allow you to avoid going into a branch and applying for a loan, and the process is usually fairly slick. Borrowell is no different. The application process is simple and takes only a few minutes. First of all, the initial credit application takes about one minute to fill out. You use some personal information that allows Borrowell to perform a credit check. The good news is that Borrowell doesn’t use a hard inquiry to check at this point, so it’s not going to affect your credit score. If you’re shopping around for interest rates for your credit card debt consolidation, Borrowell is an ideal place to start. Once you enter this information, you’ll be presented with loan options. Borrowell offers three year and five year personal loan options. If you are trying to get out of debt, this is helpful because you have an idea of exactly how long it will take you to pay off your debt. Plus, you’ll have a fixed-rate loan and possibly save thousands of dollars in interest charges. After you’ve seen what your options are, choose one and you’ll be taken to a page where you need to fill in a little more information. This page will verify your income and your bank account. In order to verify your income, you will need to take pictures of your latest pay stubs with your phone or scan them into your computer. There is an easy to use document uploader on the page that will walk you through the process. Once you’ve finished these steps and included your bank account information (Borrowell needs a place to directly deposit your money! ), small deposits will be added to your account. Watch for them and verify them online. Once that’s done, you’ll usually get your money the next business day. You can then use the money for whatever you want — including consolidating your credit card debt. Is Borrowell Right for You? One of the things I like about Borrowell is the fact that the company takes steps to ensure that it follows best practices with lending and verification. This isn’t a bad credit loan or a payday loan. It’s a legitimate personal loan with great interest rates for those with good credit. Many Canadians with good credit have found themselves in credit card debt in recent years, and Borrowell is a good alternative for debt consolidation and refinancing. It’s not a shady company, and it’s not a traditional bank with extra hoops to jump through, and you can get unsecured personal loan rates that are competitive with traditional banks. Even if your goal isn’t debt consolidation, a Borrowell loan can still help. If you want a small loan for your home business, or if you aren’t happy with the auto loan rates you’ve been quoted, this can be a viable option. I’m very excited to see a company like Borrowell make inroads in Canada. As you can tell from this review, I think it’s a great step forward, and Borrowell can be a good option for someone looking to finally get out of debt. Your blog is very helpful Mr. Drake! I have read several of your posts and I thank you for sharing your knowledge. Recently, I have tried to apply to Borrowel, but the company does not provide loans in Quebec. Are you aware of any other company (other than citifinancial) that might offer a similar service in Quebec? For the first time, I’ve been able to get a free credit score without even applying for a loan! Good job Borrowell! I’ll certainly consider a loan from Borrowell through the simplified on-line process. information is collected is entitled to free credit report (once a year I believe). Bureaus makes it difficult to get a free report online. Who uses the post office or buy stamps these days? Whos looking after consumer interest? On another note, we need more companies like Borrowell to compete with Banks that make it so cumbersome, time consuming & expensive to obtain a small loan. I had posted a negative review about Borrowell and now its removed. Borrowell said in the 2nd step provide them with 2 recent pay stubs and it will take 3 minutes and then move on to step 3. The bank verification where to deposit the money. Instead they wanted to go into my bank account and wanting to see 90 day pay deposits. I gave them a different bank and also got my password and secret question with my account number. The bank told me to immediately change my password. I had written quite a lot here but its all removed. Why is that? First time comments go to moderation before they show publicly. You posted your two comments less than an hour apart and I don’t check for new comments that often, especially during the holidays.